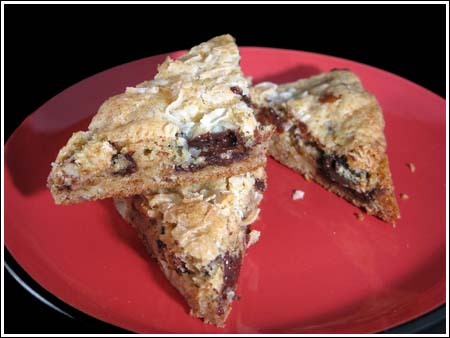 Congo Bars are similar to blondies, but their signature add-ins include coconut, nuts and lots of chocolate. They are simply, yet classy and easy to dress up. Over the years I’ve tried several recipes, including this one which I call the Mimi in Maine recipe because it was contributed by someone named Mimi. The original recipe calls for a 9×13 inch pan, but I like the bars slightly thinner so I use a 15×10 inch pan. Sometimes I halve the recipe and use a 9 inch square pan. The original recipe also calls for salted butter, but I almost always use unsalted so my recipe calls for unsalted and a bit more salt. Congo Bars are chocolate chip, coconut and nut bar cookies baked in a 10x15 inch pan. Preheat to 350 degrees F. Grease a 10x15 inch pan or line with parchment. Alternatively, you may use a 9x13 inch pan for thicker bars. In a large bowl, whisk the melted butter, brown sugar, eggs and vanilla, breaking up any lumps in the sugar. Mix the dry ingredients into the egg mixture, then stir in the chocolate and nuts. Spread the batter as evenly as possible into the prepared pan. Bake for about 20 to 25 minutes (for 15x10 inch pan) or 25-30 minutes (for 9x13 inch pan) until a deep golden brown or the coconut just begins to brown. Cool briefly, then score into triangle swhile still warm. When completely cool, pull apart. If you don't have a scale, make sure to fluff up the flour and stir it well before measuring. « Betty Crocker Cookie Finalists Are Up! and doing a project on africa im bringing in some finger food and i heard this would be best everyone in my class can enjoyy but i havee to say im not the best cooker in the worldd but thankss i hope they turn out good! Thanks for the tip on the glass pan. I’ve noticed a lot of people like using glass, so now we know to turn the heat down and bake longer if needed. I hope people read the comment section here because people always post such good tips. Blake, thanks for letting me know. At some point, I’d like to try the Williams Sonoma version. Last night I found another very similar version in The Wellesley Cookie Exchange Cookbook. The recipes is similar, but uses 2/3 cup of oil in place of butter. There’s another difference two, but I can’t remember. At any rate, someone wrote “blech” or “blah” next to the recipe, so I don’t plan on trying the all-oil version. This recipe is awesome. I made them for family and coworkers, and they disappeared! Thanks! I made these last night. I don’t have a 10 by 15 pan, so I split the dough (batter?) between two pans, an eight inch square and a nine inch square. I only added coconut to one as my kids are coconut haters (weirdos!). Since one of my pans was glass I turned the temp down to 325, and it seemed they took a bit longer to cook, 27-30 minutes. Thanks for the recipe-so good! Chocolate Lover, is that your site? Those chocolates look amazing. I’m hungry now. Jennifer, the texture is kind of like blondies, but not quite as rich and better suited to hold a bunch of good chocolate and nuts. In other words, the nuts and chocolate are what’s showcased here so I probably wouldn’t make these with every day chocolate. What’s really surprising is that even with a pound of sugar, these aren’t overly sweet. Or maybe my sweetness perceptions are askew. I did just make a Coca Cola cake! I think anything would seem less sweet next to that. 3/4 c. (180 g) unsalted butter, at room temp. Place butter and brown sugar ina large bowl. Mix together until light and fluffy. Add the eggs, one at a time, beating well after each addition. Stir in the vanilla. Beat in the flour mixture. Fold in the chocolate chips and pecans. Pour and scrape the batter into the prepared pan, smoothing the top with a rubber spatula. Bake until the top looks dry. 40-45 min. Transfer to a wire rack and let cool completely, then cut into squares. Makes about 4 dozen squares. It looks like they turned out great! If you make the Williams Sonoma recipe, you’ll have to either post about it, or let me know how they compare. I’m curious. These sound wonderful! I can not wait to try them. I LOVE desserts like this! Mmm… those look so good. I don’t have a 10 by 15 pan so I’ll have to cut the recipe in 1/2, too. Is the texture different than that of blondies?